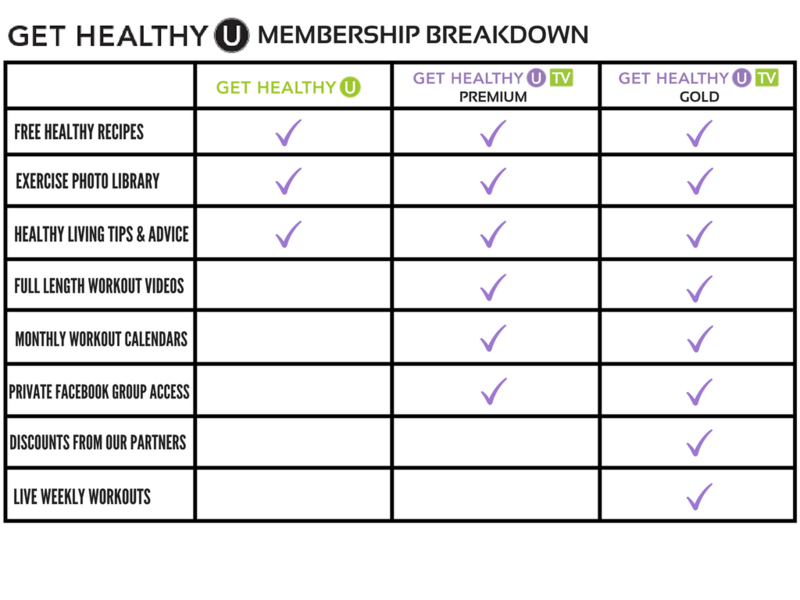 Which Level of GHUTV Membership Is Right For You? March 23, 2017 By Claire Davidson & filed under Blog. Welcome! We’re so glad you’ve come to Get Healthy U TV. Whether you’re new here, or just getting the chance to look around, we’ve compiled some great information on the differences between Get Healthy U and Get Healthy U TV membership levels. Each level has different benefits for you to take advantage of, so to help you make the most of your experience here, let’s delve into the unique features of each level! Get Healthy U is our free content site, dedicated to delivering fitness, nutrition, and healthy living advice that’s practical, truthful, and gimmick-free. It also features a comprehensive exercise library which shows you exactly how to do pretty much every exercise ever, step by step! From fit tips to nutritious recipes and articles on weight loss, aging, hormones, and more, we’ve got tons of advice on how to get healthy today. Joining Get Healthy U TV at the Premium level is a great way to solidify your fitness goals with a library full of full-length workouts to do at home whenever you want! You can stream any workout at any time on any device, including your laptop, phone, iPad, Smart TV, and more! As a Premium Member, you enjoy unlimited access to these workouts and tons of workout calendars to choose from when you want to follow along on a 28-day plan. You also get access to our exclusive Facebook group only for Get Healthy U TV members; we motivate each other, share our struggles and successes, and keep each other accountable. It’s a great way to connect with likeminded people who are on the same journey you are! New workouts and workout calendars are being added all the time—from cardio kickboxing to strength training and every yoga, Pilates, and Barre class in between! To become a Get Healthy U TV Premium Member, click here. As a Gold Member, you not only receive access to our entire library of full-length workouts to stream, but you also get 10 free workouts to download; meaning you can download 10 of these full-length workouts onto your computer for situations where you are without wi-fi (say, on vacation or a business trip). As a Gold Member you also receive access to a new LIVE workout each week, where Chris and other trainers lead you through fun, intense workouts like Pilates, kettlebell training, HIIT, and more! If you miss one of the live workouts, don’t worry! They’re saved to your account and you can watch them any time. To become a Get Healthy U TV Gold Member, click here. Can I switch from gold to premium? My annual membership is coming up this month? Currently I show that you are a Premium member and that you are due to renew at the end of the month. If you would like to upgrade to GOLD at any time, you are more than welcome to do so! Please let us know if you have any further questions and we greatly appreciate your business! Thank you for contacting us. In response to your request, we have cancelled your Annual Premium Membership. You will continue to have access to the site until:9/14/18. If you have any further questions, please contact Customer Service at 1-844-278-2050 at your earliest convenience, or chat with us on our site. I would like to switch from the gold level back to the premium level, how would I do that? Hi Jen. Please give our customer service team a call at 1-844-278-2050 and they will be happy to assist you with this. I signed up recently since my gym membership will be ending soon. Are there challenges that I can sign up for to hold me accountable? Do you have meal plans available? Hi Cara. There are lots of challenges! Once you are logged in Click on calendars on the top toolbar and this will bring up the list. Also here is a link to a Beginners Guide to Meal Prep. https://www.gethealthyutv.com/post/meal-prep-guide-for-beginners/ If you have any questions give our customer service team a call at 1-844-278-2050. How can I cancel my membership. Unfortunately I have not been using this for several months. Thank you. Hi Suzanne. We are sorry to hear you want to cancel. In response to your request, we have cancelled your Monthly Premium Membership. You will continue to have access to the site until:9/14/2018. If you have any questions, please give our customer service team a call at 1-844-278-2050. Hello. I would like to cancel my account please. Thank you. Thank you for contacting us. In response to your request, we have cancelled the auto renewal of your Annual Premium Membership. Your membership will remain active until:9/26/2019. We did want to make you aware that we do send you an email reminder 45 days prior to your renewal date, and by opting out of the automatic renewal you will no longer receive this email notification. If you decide to reactivate your Annual Premium Membership, please contact Customer Service at 1-844-278-2050, or chat with us on our site. I was automatically renewed on October 2nd and didn’t realize it. I was not planning on renewing my membership. How can I cancel and get a refund? I would like to cancel my membership please. Hello, My name is Diana Walls. I would like to cancel my membership. Please respond back to me that you have indeed canceled my membership. My email is dianamariewalls@yahoo.com or dianamariewalls57@gmail.com. Thank you in advance. I haven’t been using the membership. PLEASE CANCEL. I am showing that your membership has been cancelled per an email request. You will continue to have access until 8/5/2019. I would like to cancel my membership. I believe it renews in January. How do I make this happen? Hi Karen. In response to your request, we have cancelled your Annual Gold Membership. You will continue to have access to the site until:1/1/2019. If you have any questions, please contact our customer service team at 1-844-278-2050. Hi Emily. In response to your request, we have cancelled the auto renewal of your Annual Premium Membership. Your membership will remain active until:11/6/2019. If you have any questions, please contact our customer service team at 1-844-278-2050. I have a gold membership and am a bit confused. There were some videos listed as premium that had a price attached to them. If I do these videos will I be charged? I thought all workout videos that are on your site were free for gold members. Am I incorrect? Make sure you are logged into your account. Once you are logged in you have unlimited access to stream all our Premium and Gold videos with your membership. It sounds like you pay be referring to the cost to download the video and keep it forever. All you need to do to stream the video is press the play button in the middle of the video you are wanting to watch. Please feel free to reach out to us at 1-844-278-2050 with any questions. I just saw a subscription renewal charge show up on my credit card. I did not realize this was going to happen. I do not wish to renew at this time, Please cancel my membership and refund the $59 charge. Thank you! Thank you for contacting us. In response to your request, we have cancelled your Annual Premium Membership. Your refund amount due is:$59.00. Please allow 2-3 business days for the refund to process. Hello. Thank you for contacting us. We are sorry to hear you want to cancel your membership. In response to your request, we have cancelled your Annual Premium Membership. You will continue to have access to the site until:3/25/2019. If you have any questions, please contact our customer service team at 1-844-278-2050.